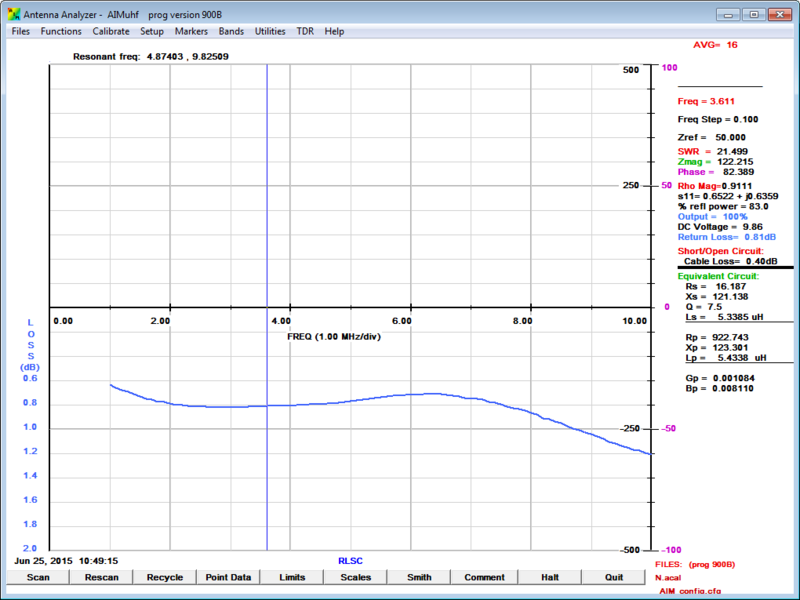 The test cable I have used is 10m of RG58C/U which I expect should have matched line loss (MLL) of 0.26dB, but I expect this to be a little worse as it is a budget grade cable that I have measured worse in the past. Above is a plot of Return Loss (RL) using the AIM on an S/C scan. 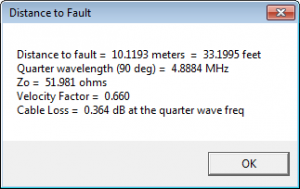 The S/C scan gives RL @ 3.6MHz of 0.81dB, implying matched line loss of 4.1dB/100m. My correspondent was about to condemn a cable based on a scan indicating around double the expected loss for good cable. Above is a plot of Return Loss (RL) using the AIM on an O/C scan, RL at 3.6MHz is 0.42dB making MLL 0.21dB… well under the spec for good cable and unbelievable! Which, if any, measurement is correct? Above is a S/C scan with the O/C scan overlaid (with circles). Neither measurement can be used simply to infer MLL other than possibly at the point where they cross over. The statement the one-way cable loss is numerically equal to one-half of the return loss seems inconsistent with the measurements. 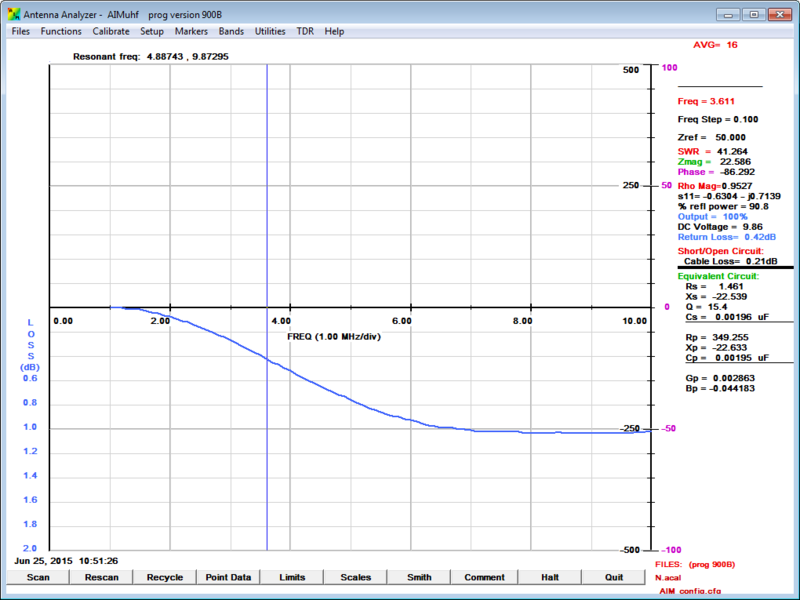 The above measurements were done with Zref set to 50Ω, 50.00+j0.00Ω to labour the point… yet Zo of the real cable is a little different, probably closer to 50.02-j1.19Ω for good RG58, let me guess 50.02-j1.60Ω for my poor sample. Above is calculation of RL using O/C Z reported by AIM and my estimate of Zo, RL wrt Zo at 0.63dB is quite a deal higher than AIM’s RL wrt 50.00+j0.00Ω at 0.42dB. 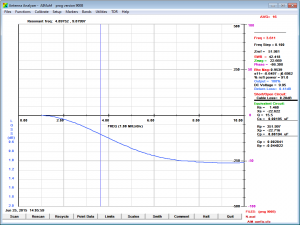 Above is calculation of S/C RL using Z reported by AIM and my estimate of Zo, RL wrt Zo at 0.61dB is quite a deal lower than AIM’s RL wrt 50.00+j0.00Ω at 0.81dB. The two RL figures calculated for approx Zo rather than Zref are much closer. You can see that if RL is calculated wrt to actual Zo, the value of close to 0.6dB means a MLL of 0.3dB ( little higher than good RG58, but as mentioned that was expected). So the statement in the AIM manual is technically correct when talking about RL wrt Zo of the actual line, but misleading as the reader is not warned that the displayed value for RL in AIM might be significantly different to RL wrt Zo. 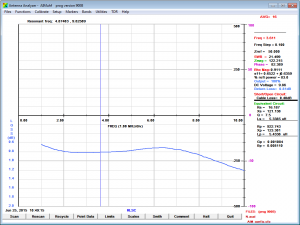 Above, AIM’s measurement of Zo at 4.89MHz. As stated, it is implied that Zo=51.981+j0.00Ω. Above is an O/C scan with Zref=51.981. The departure of the RL plot from a straight line through the origin indicates that Zo is NOT 51.981Ω. 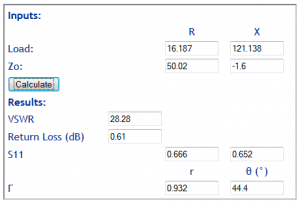 We know because the cable is quite lossy, that there is a significant X component that does not appear in AIM’s measurement result. It turns out that the average of RL calculated for S/C and O/C terminations at some Zref close to that of the actual cable is a quite good approximation of RL at Zo, and so gives a good estimate of MLL (being half of the average RL(Zref), so in this case (0.42+0.81)/2/2=0.31dB MLL. More discussion at On Witt’s calculation of Matched Line Loss from Return Loss .